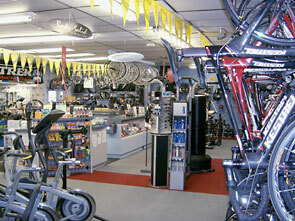 Spokes Bike Shop was opened on August 9, 1986, in the town of Hamburg, PA, and has been growing ever since. We are a family owned business and our customers and great service come first. We are avid cyclists and are happy to offer our expertise to experts and novices alike. Spokes incorporates weekly support rides Mtn and road, sponsors racers and is involved in bicycle advocacy with Walk Bike Berks organization. We believe it is a very gratifying experience to offer FUN on your menu and to watch folks take charge of their lives and get fit by bicycling. We are able to watch the transformation and see the positive fitness and lifestyle improvements that result from cycling, and it makes us smile to be a part of that!